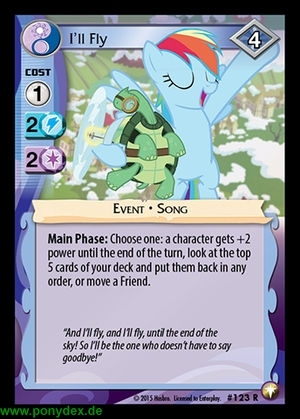 Main Phase: Choose one: a character gets +2 power until the end of the turn, look at the top 5 cards of your deck and put them back in any order, or move a Friend. "And I'll fly, and I'll fly, until the end of the sky! So I'll be the one who doesn't have to say goodbye!"